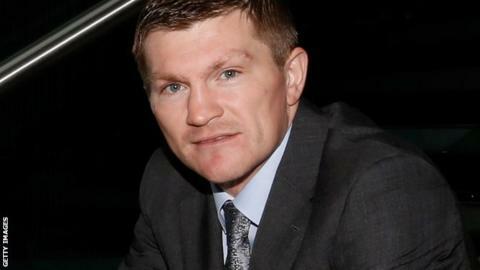 Ricky Hatton says he is ashamed of himself for "becoming a failure". But the former world champion at two weights, who retired from the ring in 2009, hopes to redeem himself when he makes his boxing comeback in November. Hatton, 34, has spoken of how he nearly killed himself over newspaper stories of him taking drugs and binge drinking. "Most mornings my girlfriend would have to come down the stairs and take a knife out of my hands," he told BBC Radio 5 live's Sportsweek. "I had a knife to my wrists and was in a really bad way - I was hysterically crying for no reason. "It was a really horrible, dark place. I was nearly ready for a nervous breakdown. I suffered with depression and I was suicidal. "I've always liked a drink but my drinking went off the scale and I was having blackouts. "But even if I wasn't going for a drink and was stone-cold sober I was trying to kill myself. "I didn't have the bottle to go through with it, I'm happy to say." Hatton won his first 43 professional fights and had held WBA and IBF world titles at light-welterweight and the WBA welterweight belt before suffering two brutal knockout defeats - against Floyd Mayweather in 2007 and Manny Pacquiao in 2009. That led to a downward spiral in Hatton's life where he was binge drinking and weighed 14st 10lb, a weight Hatton describes as "nothing short of heart-attack material". He was also pictured in a newspaper taking cocaine, which led to his boxing licence being temporarily removed in 2010. However, the birth of his daughter Millie, who is now one, along with the desire to "redeem himself" has helped Hatton turn his life around. He will return to the ring on 24 November when he faces former WBA champion Vyacheslav Senchenko in Manchester, but Hatton believes his biggest fight has already been won. "With all the social troubles I had, my life went down the pan," he added. "The lowest point was knowing [my son] Campbell had the misfortune of seeing daddy in a bad way. "I wasn't going to do it to my kids and put my family through that. "I feel ashamed of myself and I have a little fellow that sits on my shoulder every day telling me I'm a failure; that I let my family, my fans, British boxing and British sport down. "It doesn't matter how many people say 'don't be hard on yourself', I feel like I have to redeem myself to my fans, my family and the whole of British sport. "Everything I've done in my career has been for nothing. "I don't want people to say to Campbell and Millie, 'your dad was a great fighter but didn't he blow it'. "I would rather get flattened so at least I can look at myself in the mirror and say I gave it my best shot." Hatton, who will have slimmed down to 10st 7lb for his fight against Senchenko, believes he is now in the best shape of his career. He concluded: "I want people to look at me as a four-time world champion, in two weight categories, as a down-to-earth man of the people, not the joke that I had become. "Life kicks you hard but you have to be a man to come back. "I've not thrown a punch but I already feel like I've won." You can listen to Ricky Hatton's full interview with Garry Richardson on BBC Radio 5 live's Sportsweek programme from 08:30 GMT on Sunday, October 28.